Madonna Dei Bagni | Travel Umbria! Just minutes from Deruta, right off of E45 is the tiny town of Casalina, and the Sanctuary of Madonna dei Bagni. 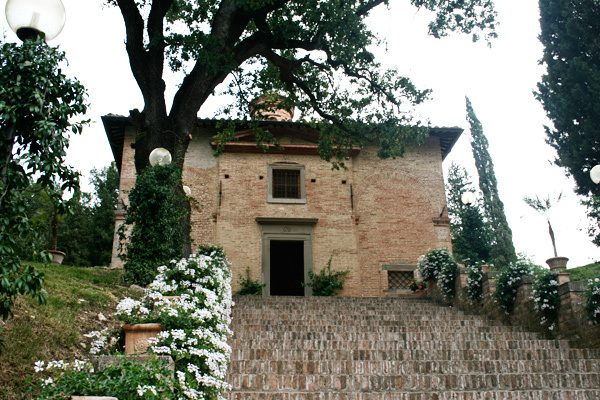 Madonna dei Bagni is a small shrine from the 17th century, rich in local history that is well worth a visit. The shrine contains about 700 votive tiles that adorn the walls of the tiny church, dating back almost 400 years ago. It is said that it all began with a local merchant from nearby Casalina, who found a fragment of pottery which had a portrait of the Madonna painted on it. Worried it might get broken, it is said he nailed it to an oak tree. The merchant, whose name was Cristoforo di Felippo returned to the tree a few years later to pray to the Madonna for his gravely ill wife. After he returned home, he found his wife completely healthy, and in gratitude he commissioned the first votive tile to give thanks for giving his wife back her health. For the next almost 400 years, local residents have carried on this tradition by creating tiles as thanks for God’s intervention in resolving their problems. Subjects of all kinds are depicted on these tiles, each one telling a story, and these tiles are given as offerings also known as “ex-votos” for actions or material things vowed to God (or promised to a Saint for their intercession with God) in return for a hoped-for miracle, offered in thanksgiving for an already-answered prayer, or given in thanksgiving for blessings not even vowed. Artworks offered ex vote, depict the miracles for which the votive is being offered, and many bear the initials PGR, per grazia ricevuta, or for grace received. Shortly after the tile was given in gift, the building of the church began around the site where the oak tree stood. That tree can now be viewed behind glass above the altar of the church, with the fragment of painted crockery still attached to its trunk. Once the church was completed, local citizens carried on the tradition started by the merchant di Felippo by commissioning their own tiles to give thanks to the Madonna for her various interventions. Over the next 4 centuries, these tiles were added one by one and began covering all of the walls of the sanctuary. Unfortunately, in 1980 many of the votive offerings were stollen, and the shrine was closed for a number of years. Some of the stollen tiles have been found, while others have been reproduced to resemble those missing tiles from photographs. Unfortunately though, after the theft, the church now must be more closely guarded to prevent any future theft so the opening hours are limited. The tiles covering the sanctuary walls both tell a personal story of tragedy overcome, as well as show the amazing progression of the art of painted majorca over the past 400 years. While the original tiles were quite simple in design, using just a few colors, the more recent tiles are more intricately painted with many colors included. You can also follow the progression of local history by viewing the tiles from hundreds of years ago up and their progression to recent years. Although tiny and quite simple in appearance, the small sanctuary of Madonna dei Bagni is well worth a visit and reflects the strength and resilience, as well as the strong faith of the Umbrian people. Opening hours may vary, but the church is usually open Saturday mornings.